–> Purchase Japanese Regular tankoubon from YesAsia! 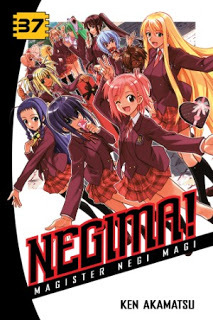 For detailed chapter summaries of Negima! Volume 37 with chapter reviews, look below. The way volume 36 ended in a rather anti-climactic way had left me rather disappointed, but at the time, I felt I could understand why Akamatsu-sensei might just want to get it over with. After all, the Magic World arc had gone on for a very long time, so going back to Earth and to Mahora would be a welcome respite. Thus, volume 37 starts with Natsumi waking up to normality and I for one was looking forward to some aftermath stories as well as stories of the girls reacclimating to their old lives. Indeed, Akamatsu-sensei gave that impression, going so far as to modernize the original 2-page spread of the girls in the class from when Negi first arrived and today. I decided that Fate showing up as a teacher could be fun, and indeed, it was initially. The cheerleaders going on a triple date with the adult versions of Negi, Fate, and Kotaro was especially delicious. Learning of Negi’s plan for the Magic World/Mars was good, including how he enlisted Ayaka and Chizuru to help him (and Ayaka’s pactio was rather fun). Setsuna’s own struggles with understanding how she fit into things now that they were back was rather interesting to me. I liked how Asuna dealt with Setsuna suddenly becoming prostrate before her all the time. I liked how Setsuna sought advice of classmates like Kaede, Ku Fe, and Mana. Of course, Eva’s painful session with Setsuna, combined with Eva deciding to take advantage of Asuna and Negi arriving on the scene to set up a fight her one of her resorts worked quite well. Setsuna (and subsequently we readers) learn the price Negi and Asuna paid, after which we get to see a final battle between Eva and Negi. Win-win. The final story arc (not counting the close down chapters) starts in this volume, and is where most fans have a problem. I think I’ll delay most of my remarks on what happen here until I review the final volume. What I will say is that I did like how the cheerleaders reacted to learning of the true nature of pactiones and the number of girls whom Negi had kissed. Furthermore, I understand why the events that happened transpired the way they did. But, I’ll say no more now. I will say that one of the things I didn’t like was the absence of certain things from the immediate aftermath chapters. While we got to see what Yue’s former classmates at Ariadne were doing, we were never shown what happened to Fate’s girls, nor what happened to Anya. That was the one aspect of this volume that annoyed me. Of course at the time these chapters were coming out, I had no clue that the reason Akamatsu-sensei didn’t say anything was because he was ending the manga and didn’t want to take the space to explain these things. I still say a throwaway line or two could have been used to do the job. On the Kodansha side of things, honorifics are here, including all the brother/sister ones. The Nibley twins do their usual fine job. Fan art, pactio card line art, Japanese tankoubon cover line art with notes, and some translator notes. In the end, based solely on the content of the volume and discounting what was about to happen, I liked this volume. It is sad that what had been my favorite manga is coming to an end, but maybe Akamatsu-sensei will revive it down the road. In the meantime, only one volume to go. Wow, I didn’t expect you to beat me to punch, since you said you were swamped with books to review at one time. Then again, Negima! did move down a spot in my lineup, along with another title, because I received the fourth book that I preordered. It looks like Kodansha is skimping people on their title’s other than Negima! though, according to your review. >Wow, I didn’t expect you to beat me to punch, since you said you were swamped with books to review at one time. >It looks like Kodansha is skimping people on their title’s other than Negima! though, according to your review. I meant things like omitting translation notes, which I found out I was wrong about in a recent review, and an honorific definition list. I didn’t think you stayed up past midnight? I should not be surprised though, considering the timestamps of your tweets. I don’t understand why Akamatsu didn’t at least show what happened to Shiori. It seems like Shiori never got a chance to go to Mahora. Shiori would have had to have been given an artificial body like Cocone was. But yeah, I really wish something had been said to suggest what happened to Shiori. You mean, other than “Because Akamatsu just decided to kick his magnum opus to hell and run, not caring if he derailed the girls into cruel harassers who lost all their previous character development and respect for the boy who not only saved their lives, but most of them are supposed to love”? If it’s anything like your apologisms over the whole situation around the time the chapters came out in Japan, then sorry, but I’m still not buying it. I can’t believe Akamatsu never revealed who the girl Negi loves is. Sure, keep telling yourself that. Don’t be offended, please, but sometimes, it unnerves me a bit, how… Pollyanna you are about these things. Especially with the smilies there. I’m not sure if Akamatsu even going to do a sequel of Negima. Well, he may not. We’ll have to wait and see. And what about Negi’s father? Where was he during the last 10 years, or even after he appeared to help Negi that snowy day? I just don’t understand how Nagi could possibly be the Mage of the Beginning. And what about Arika, Zect, and the Master of the Gravekeeper’s Palace? Who was the girl as the Life Maker during the Great Mage War? With all those questions, I feel like there’s a volume missing between 36 and 37, before the end of the Magic World arc. Well, maybe Volume 38 will explain a few things. >And what about Arika, Zect, and the Master of the Gravekeeper’s Palace? Who was the girl as the Life Maker during the Great Mage War? It is all this and more that will make it VERY irritating if Akamatsu-sensei doesn’t pick Negima! back up to fill in the gaps. Apropos of nothing, would you happen to know of any bonus comics that came out after the end or in the Japanese volume 38? I heard of one detail about Haruna from them on the trope page, but I can’t find it. I have yet to pick up volume 38 tankoubon, so I can’t speak to what the Japanese volume has. What did the trope say?